Is there a reason why you don't want it to go through? It's in the edit, walkers. Btw, staff members both times. Go figure. So what you're saying is, you won't be apart of it because a tunnel was going to go below your lands? Thats the whole point of this, Making a tunnel go below people's lands to aid in transport. "Oh, I see that the tunnel will be going below our lands, well, because it's going below our lands, we have decided to not be apart of it. Maybe if the tunnel wasn't for going beneath our lands we would have helped"
That is essentially what you are saying. If you want it go a particular way, post an edited map here, post co-ords that it would have to follow or pm me. This isn't possible unless there is cooperation which Bos34ton and The Order have been very good at. Palmer is even helping to make more accurate maps, because the one I have up is supposed to be a guide. "Staff members both times" When this idea was thought up, I wasn't a moderator, when the map was made I wasn't a moderator. Stop blaming the staff. V2, as long as THP owns that land, don't they have every right to refrain from working within the WRN network, and you have a responsibility to prevent any expansion in their land unless they decide to work with the project? He obviously knows that, he's just bummed about it, perfectly reasonable reaction and he'll get over it soon and move it. No need to keep provoking. No provocation, just asking a legitimate question. A rhetorical question that you know he knows the answer too. In fairness, V2 might be bummed about it...but is he bummed about the fact that he cannot create a tunnel upon land that he has no permission to do so? It is not rhetorical, it is stating rules. 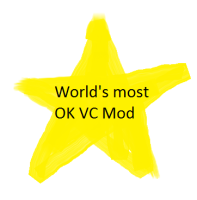 He took an oath as a mod to uphold VC rules, and I am simply asking about that. Based on his last post, it was more a jab at Tauto for not allowing the THP expansion, so I don't see what the big deal is from you either. I think you know the answer too, so I suppose now you are interested in provoking a war of words? No need for that. Are you seeking to derail the thread? Get on track Walkers. V2, you should re-read my post again. I started pretty clearly why we no longer wish to participate. It's not because we don't want tunnels on our land...it's the assumptions from the staff involved in the project that they can put the tunnels wherever they want. And for the record, when you posted that updated map 8 days ago with that added tunnel running north through our land, you most definitely were a mod. I'll be home from work in a few hours, I'll post a map of THP showing where your tunnels may run. Tautochrone wrote: I'll be home from work in a few hours, I'll post a map of THP showing where your tunnels may run. That'd be swell dear ! Meh, I'll post a map whenever I can get online and get a screenshot of THP to draw on. Tautochrone wrote: And for the record, when you posted that updated map 8 days ago with that added tunnel running north through our land, you most definitely were a mod. Oh really? Well this is the first map I put out and it still had tunnels running through THP, roughly in the same areas as the current map except that in the current one I replaced the diagonals with more straight lines. 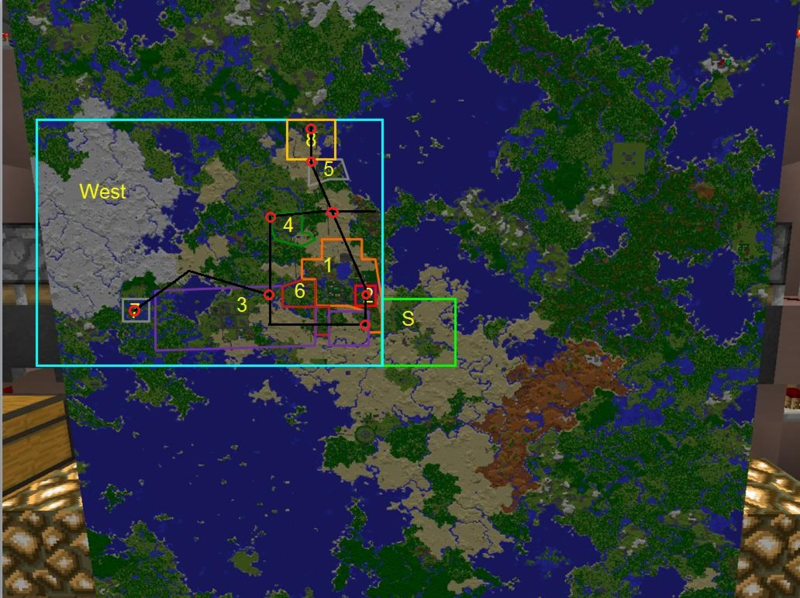 And a map just after that with more obvious tunnels below THP. Both were posted before I was a mod and both had tunnels below THP. Anyways, what difference does it make if I was a moderator when I posted the image? That doesn't influence where I draw a line on a map or where a tunnel would go. And guys, yes I am bummed about THP's sudden change in opinion but I guess if they want to be awkward, there's nothing I can do about that. Gotta get input from the other THP members on where we think the tunnels can go. Gimmie some time to get in touch with all of them (well, most of them) and I promise I will get back to you on this. It looks like there's plenty of digging still to do in other places so I doubt this will halt progression. For clarification, here's a well-defined map of the current plans for the WRN. Dashed lines are, obviously , under consideration by the land owners and WILL NOT BE BUILT until an agreement can be reached. Feel free to consider any part of the system, except BosLine, to be under scrutiny for changes and (if-needed) workarounds. 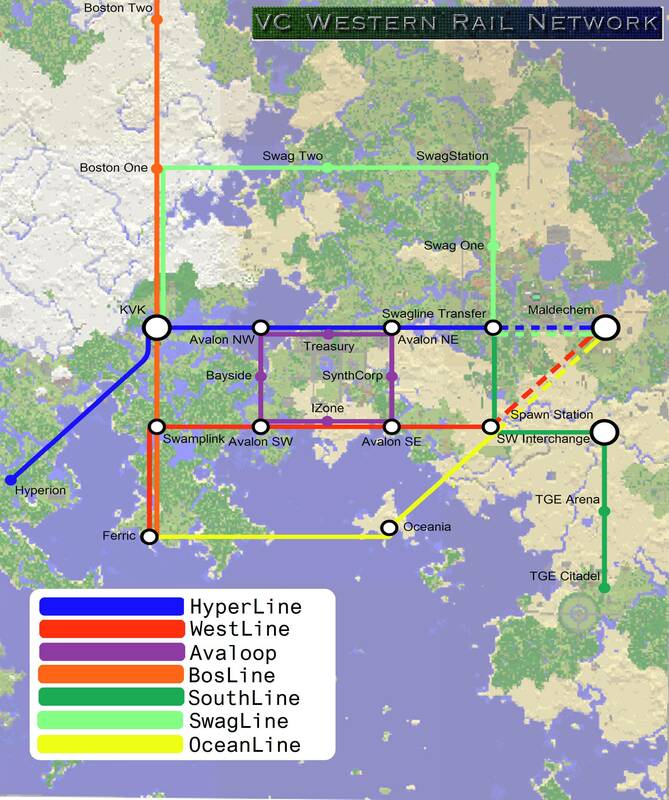 The routes on this map are approximate, and I will be gathering potential coordinates for each station in the near future. V2, feel free to put this map in the OP. Palmer, do you have a blank copy of that map that I could have? I only have a world map and a super-zoomed in version that doesn't even cover all of THPs land. Thanks. This map only covers the west. I can provide perspective-fixed maps for the rest of the world, if anyone so desires. 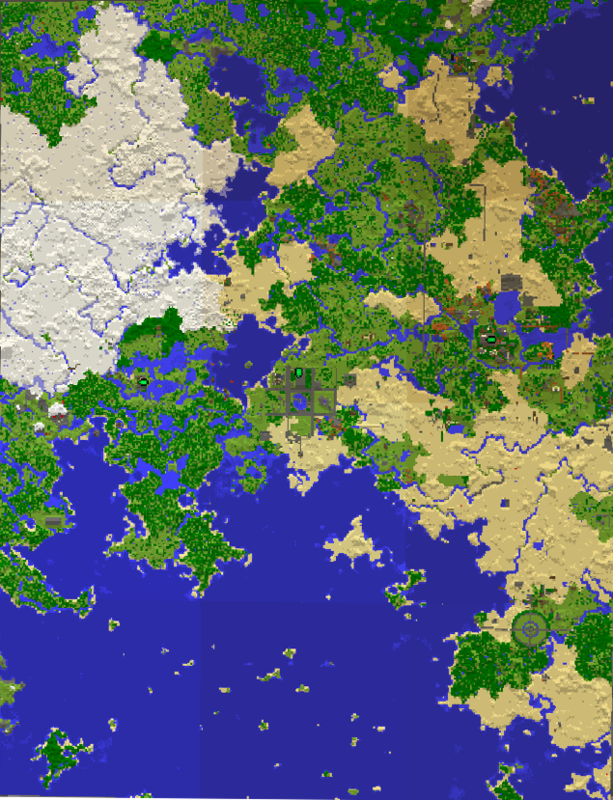 Due to minecraft's field-of-view, it's a bit fiddly to get a perfectly vertical perspective on large maps, as I'm sure most people who try to use ingame maps have found. I just use photoshop.